Soda Making - IncrediBREW - Brew your own Beer and Make your own Wine. 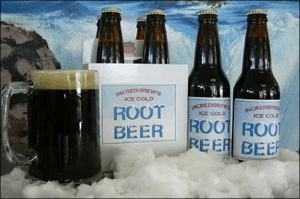 Make your own Root Beer, Sarsaparilla, Birch Beer, Orange Cream Soda or Black Cherry without the mess! Who Can Forget the Taste of Old Fashioned Soda? We assist you in making 4 gallons of your favorite soft drink. Each $45 batch makes about 48 -12oz. bottles and includes everything you need – ingredients, equipment, bottles and caps. It only takes 15 mins. of weighing and mixing the first day, then you leave it with us for a 2 day carbonation cycle. When you return, it takes about 45 min. for bottling with our automatic bottle filler. For an additional $15 you can add your own personalized labels for a truly unique touch. Bring the kids or even the grandparents for a fun time and a taste you will always remember.